Fall is home to some of the beer nerd's most distinctive seasonal styles. 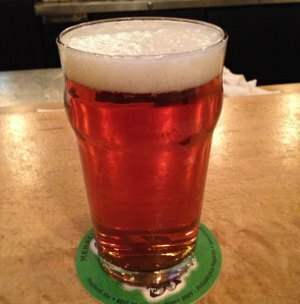 The most popular are, of course, pumpkin beers and Oktoberfest beers. Very different styles, but both represent the season well. In recent years, a third seasonal brew has been charging ahead as well, albeit a somewhat less defined one: the harvest beer. Usually, this involves freshly harvested hops, used within a couple days of being picked off the vine, but there's also the occasional barley harvest beer too. Still, the hoppy harvest seems to be the thing that inflames beer geeks' passions. Using fresh hops gives a slightly different flavor profile to a beer than you would get from dried or pelletized hops, and this is basically the only time of the year to get such beers. Beer Nerd Details: 5.8% ABV on tap. Drank out of a nonic pint glass on 10/12/12. Beer Nerd Details: 5.5% ABV on tap. 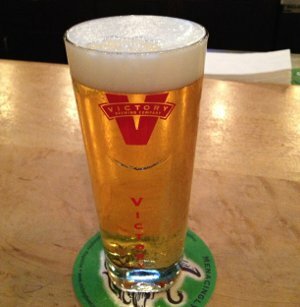 Drank out of of Victory's 0.3L glass on 10/12/12. There you have it. Lots of exciting Victory stuff coming up, so stay tuned for that. And check back in tomorrow for a look at Tröegs' Fresh Hop Ale (and something else called Special HOPS Ale). This page contains a single entry by Mark published on October 23, 2012 10:58 PM. The Oak Bolleville was the previous entry in this blog. Double Feature: Itchin For Some Tröegs is the next entry in this blog.